The picture below is a scan of a coloured slide I took a number of years ago. The quality isn't brilliant but it wlll hekp me give you a little more information. The east coast of the island of Oahu, Hawaii gives you an idea of how rugged volcanic coasts can be. Many locations in Hawaii have been used in movies and television shows. 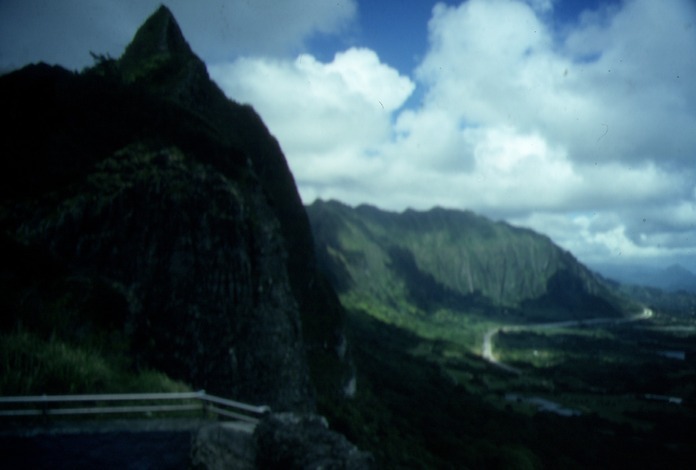 "Lost" and "Jurassic Park", for example, made use of Hawaii's rugged and beautiful locations. 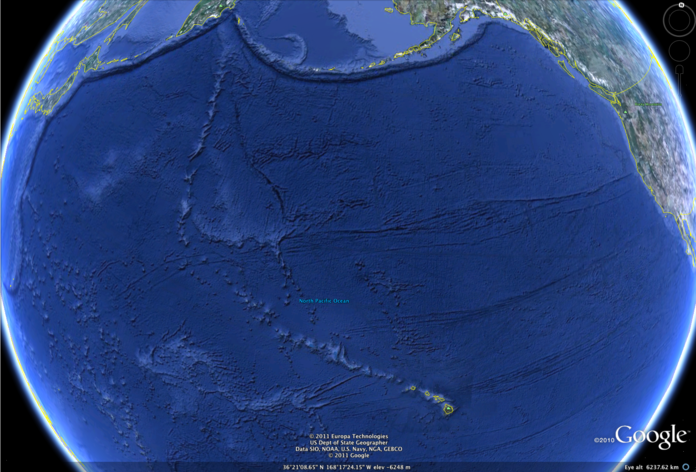 The Hawaiian islands are located over what is known as a hotspot*. Over millions of years, the movement of the crust has caused volcanoes to appear in a chain. Look at the Google Earth image below. Stretching away to the north-west, you can see the chain of submerged islands that may once have been above the water. Google Earth allows you to see these. It's a great way of looking for geological features on a large scale. Have you already loaded it so you can zoom in? The hotspot is still very active. A large new volcano is already growing beneath the ocean to the south of Hawaii and will most likely one day be seen above the ocean surface. We have a very active world beneath us. Posted in Geology, Rocks and Minerals, Volcanoes & Earthquakes on May 23, 2012 by rossmannell.